Many times you cannot boot into normal Windows mode because of wrong user password, you can start Windows XP in safe mode and login the default admin account to bypass other user password. What is XP safe mode? All versions of Windows come with a diagnostic setup called "Safe Mode". Safe mode starts Windows with a limited set of files and drivers. Startup programs do not run in safe mode, and only the basic drivers needed to start Windows are installed. Many average PC users are unfamiliar with the purpose of Safe Mode and only encounter it when there has been a system crash or similar problem. They are then puzzled by what to do next. Safe mode is the best thing to use if you are having any problems booting your system. 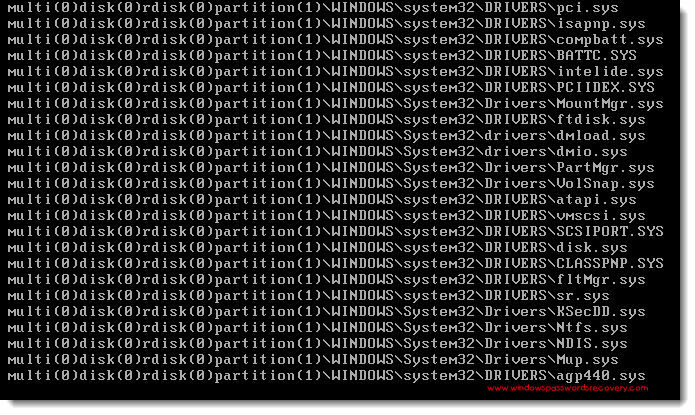 The purpose of Safe Mode is to help troubleshoot computer problems by operating with a bare minimum of drivers and Windows components. It can also be used if you have any issues form running any new software on your computer. By reducing what is running, Safe Mode can help you diagnose a problem caused by a faulty driver or software. What is XP default administrator account? Windows XP passwords are used to protect the system against unauthorized intrusion. The default Administrator account on an XP machine is typically reserved for performing special tasks on the computer since it has no security restrictions placed upon it. It is often overlooked, and many users do not even know that it exists. If you have forgotten the password for the normal account on your XP system, you can bypass it by login the default admin account. Tips: Restrict the access to safe mode by setting administrator password! How to get into XP safe mode and bypass user password? Step 1. To get into the Windows XP Safe mode, as the computer is booting press and hold your "F8 Key" which should bring up the "Windows Advanced Options Menu" as shown below. Note: With some computers, if you press and hold a key as the computer is booting you will get a stuck key message. If this occurs, instead of pressing and holding the "F8 key", tap the "F8 key" continuously until you get the startup menu. Step 2. 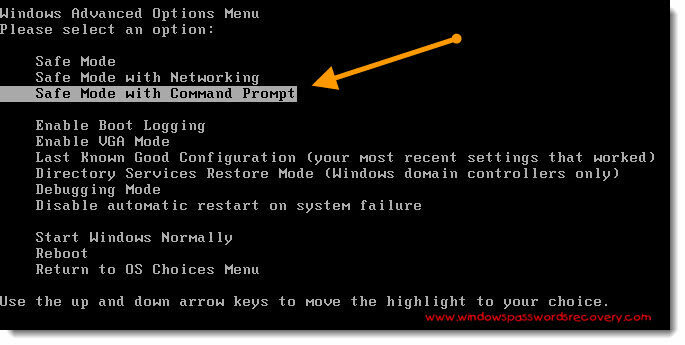 Use your arrow keys to move to "Safe Mode with Command Prompt" and press your Enter key. Step 3. Select the operating system to start. Step 4. Windows XP Safe Mode is loading. Step 5. A logon screen displays all OS user names, there are 2 accounts in this example: Administrator, Mike. Here we assume that you want to bypass the "Mike" account password. Enter password for your administrator account to get in safe mode, the default password is blank if you never set a password for administrator before. It is similar with the normal logon screen, but normal logon screen will only list Mike. Step 6. After entering safe mode, you can see the Windows command prompt. Enter "net user" and press Enter to list all the user names in your Windows XP. Enter "net user Mike 123456789" and press Enter. It means that you want to reset "Mike" account password to "123456789". When it takes effect, you can login the "Mike" account with the new password of "123456789". Step 7. Enter "shutdown -r" and press Enter, the System will be restart, then you can access Mike account in normal logon mode. How to bypass xp password if the default administrator account is also protected? Sometimes, you may set a password on the default admin account to enhance security, you also forgot its password. What can you do now? Step 1. 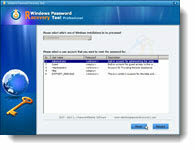 Download a boot CD, such as Windows Password Recovery Tool Professional, from the Internet. This type of boot CD has a password reset program that can be used to bypass the Administrator password in XP. Step 2. Install and run that application program. Step 3. Burn the boot CD (which comes in a writable ISO file format) to a blank CD. Step 4. Take the boot CD that you have burned and insert it into the computer whose Administrator password needs to be reset. Start the computer and boot from the CD. Step 5. Choose the password reset option in the boot CD. This option will be located differently depending on what type of boot CD you choose, but in each case the general process for launching it will be the same. Step 6. Select the Administrator account as the account you wish to modify and choose to either reset the password or completely remove it. Step 7. Restart the computer and allow it to boot to the operating system. Log in to the operating system on the Administrator account using the new password you have chosen. Now you don't need to worry about lost Windows XP Password, this software can help you. It supports all versions of Windows OS, including Windows 7, Vista, XP, 2000, 2003, 2008.